Bishop Ken Carter leads his first Florida Annual Conference communion service. Photo by Dave Walter. 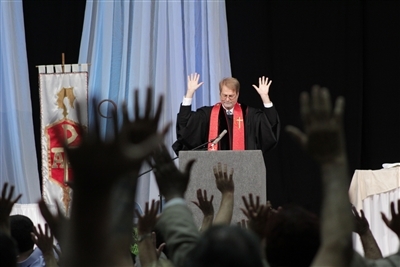 LAKELAND – The Jenkins Arena at The Lakeland Center was filled with people holding hands and connecting with one another Thursday, as Rev. Dr. Ken Carter led his first Annual Conference Service of Word and Table as Florida's bishop. In his sermon, "Overwhelmed and Undernourished," Carter painted a picture of communion as a meal and called to mind many important biblical stories involving sharing food. Carter led worshippers in a time of reaching their hands up toward God, then reaching out to one another as communion drew them closer to each other. The bishop pointed out that Methodists practice open communion, following the example of Jesus, who ate with everyone, even sinners. He encouraged the audience to turn away from a culture that often views worship -- and communion -- as optional. “We are overwhelmed and undernourished,” he declared and offered the practice of communion as a way to get in touch with God and with each other. As is traditional, the "bishop's offering" was collected. Carter listed the recipients that will each get a third of the total collected. The first is Stop Hunger Now. Carter asked the crowd how many had participated in the Annual Conference packing of 100,000 meals for the global hunger relief effort and the show of hands appeared unanimous. This donation is earmarked for smaller membership churches so they may help feed the hungry in their neighborhoods. The second recipient will be the Wesley Foundation at Florida State University for renovation and replacement of facilities. Carter described this as one of the strongest campus ministries of any denomination in the U.S. He said he had asked arch rival Gator Wesley at the University of Florida about this gift to FSU’s foundation and they had given the thumbs up on it. The third recipient will be a fund to support younger clergy of color in the Florida Annual Conference. He announced that the Florida United Methodist Foundation has voted to match the Annual Conference offering for this effort. The Communion service began with a humorous monologue delivered by Isaiah Cruz, who attends after-school programs at First UMC, Lakeland.